If you’ve been vaping for any length of time, odds are you’ve heard about the “the suit”. Of all the ongoing fights to save vaping, this lawsuit – which pits Nicopure Labs and Right to be Smoke-Free against the FDA – is arguably the most important of all. Now, with the #FundtheSuit, you can help take the fight to the next level. The lawsuit suffered a minor setback this past July, when a District Court ruled in favor of the FDA, but the fight is far from over. The case is now moving to the appellate court (you can read more about the details of the appeal here), and maybe as far as the Supreme Court. Nicopure Labs and Right to be Smoke Free are committed to seeing this fight through to the end – even if that means going to the highest court in the land. That costs money, and with funds in the war coffers running low, they’ve turned to us – the vapers, the vape media, vape shop owners, influencers, and anyone else even tangentially involved with this industry – to help cover the cost. Nicopure Labs and Right to be Smoke-Free tell us that they’ll need at least $250,000 to see the fight through to the end. They need our help. #FundtheSuit is the GoFundMe page where you can go and contribute to the cause. $250,000 is a big number, but we vapers are legion – and no contribution is too small. If we all chip in, spread the word, and get involved, we can make sure our voices are heard in the highest courts in this country. If we don’t make this happen, the FDA could very well eradicate the vaping industry. That’s not hyperbole – the FDA itself acknowledges that 97% of vapor manufacturers will go out of business if its proposed Premarket Tobacco Application Process is put into effect as currently configured. This lawsuit would prevent that from happening. If you’re worried about your money being sucked up by middlemen, don’t be. All the funds raised in this campaign – save for the required 3% and $0.30 per transaction fee required by GoFundMe – go directly to funding the lawsuit. While these contributions are not tax deductible, they are going directly to the source. For those who can’t spare even a single dollar, it’s okay – you can still help. 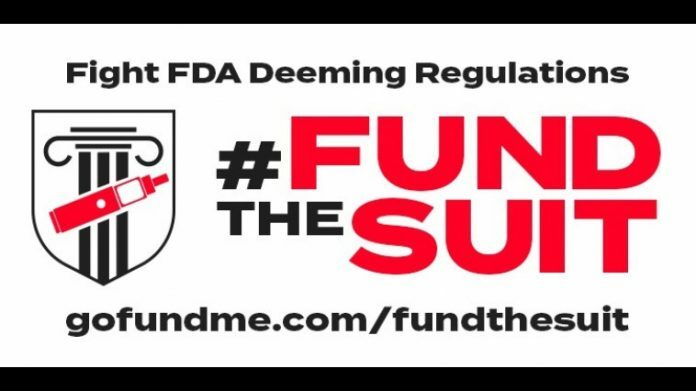 Hit up social media and spread the word using the #FundtheSuit hashtag, share the link to the fundraising campaign far and wide, tell your local vape shop that they can get involved. Every little bit helps when the stakes are this high. Let’s fight. And let’s win this thing. Help #FundtheSuit.